Your first visit with us will involve assessment and discussion about your treatment options. Our doctors will first discuss your medical history with you and examine the areas of concern. Our team will then utilise state of the art ultrasound imaging equipment to examine your condition. This innovative technology provides the highest imaging resolution available to allow our medical professionals to examine both deep varicose and superficial veins with ease. The results of this examination will be discussed in depth with you and our doctor will take the time and patience to answer any questions you may have in relation to your condition. After discussing the various treatment options available you will be provided with a cost assessment and treatment schedule. This initial consultation generally takes around an hour, and you will be provided a gown to wear during the examination of your legs. After your consultation we will endeavour to offer you the first available treatment time should you decide to proceed with treatment. At Vein Doctors Group, we generally do not perform same day treatments unless you are from out of town; in this situation there is a comprehensive process that our receptionists will discuss to enable same day treatment. Patients are encouraged to discuss our doctor’s findings with your family. To discover more about your first consultation at Vein Doctors Group, or to arrange an appointment, please contact us. 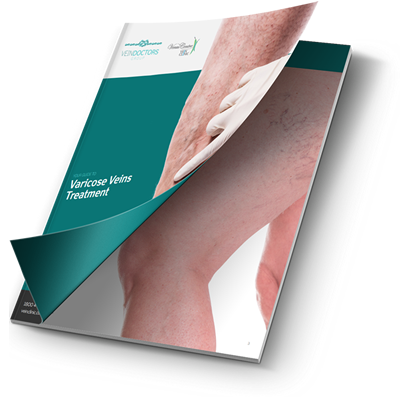 Download your free guide to varicose veins!